A wee ducky for your fairy pond. Get several for an adorable tiny parade! 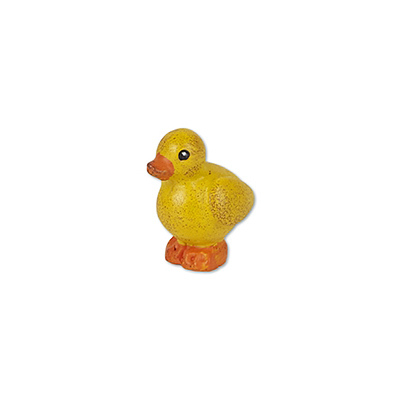 Decorative miniature baby duck in yellow with orange beak and feet features all-weather paint in a handcrafted distressed finish safe to place anywhere, inside and outdoors. Designed by artist Genevieve Gail for Studio M's Gypsy Garden Collection. If you love this colorful artistic look, come visit our St. Clair Shores store for more fairy garden accessories in this line, including flowery furniture and small animals! We're happy to make you a custom garden to hold all the little treasures you find.